When Kelly Gallagher learned that his ninth-grade students could not name the vice president of the United States, and when two seniors asked him in all seriousness, "Who is this guy, Al Qaeda?," Kelly was shocked into realizing he needed to do something outside the standard curriculum to build his students' background knowledge. 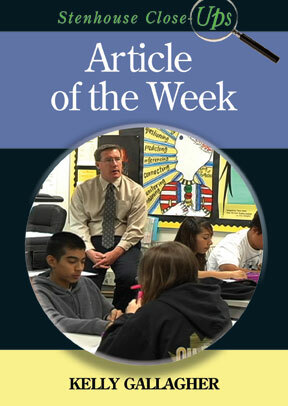 In response, he developed the Article of the Week activity to address the serious gaps in his students' education. Each week, students read a short article that informs them about the world. Students highlight passages and words they don't understand, consider the author's purpose and intended audience, and work through any confusion. The class then discusses how the structure and craft of the article informs reader comprehension and how they can implement these elements into their own writing. In fifteen minutes, Kelly shows teachers how to integrate the Article of the Week into their own classrooms in a manner that provides the background knowledge that is the foundation for critical reading.